FILE - Eritrea's capital Asmara is seen Feb. 19, 2016. A Republican congressman says he believes it is time for the U.S. to reach out to Eritrea and forge a partnership to fight terrorism. U.S. Rep. Dana Rohrabacher of California submitted an amendment to the National Defense Authorization Act that would encourage the U.S. secretary of defense to negotiate with his Eritrean counterpart to cooperate on the war on terror, security in the Red Sea region, confronting Iranian proxies in Yemen and other U.S. security priorities. The amendment was rejected, but Rohrabacher said he may try to push for cooperation with either a future amendment or standalone bill. "I think it's time for us to reach out to Eritrea and take them up on some of their offers, and do things that would be good for us and good for the order of the world in a sense they would be opposing radical Islamic terrorists," Rohrabacher told VOA in an interview this week. FILE - Rep. Dana Rohrabacher attends Politicon at The Pasadena Convention Center, in Pasadena, California, July 30, 2017. Human rights abuses and authoritarian rule have long made Eritrea an international pariah. The U.S. currently has no military-to-military cooperation with the country and, although there is an embassy in the capital, Asmara, there is no U.S. ambassador. Eritrea and many members of its ruling regime are subject to U.N. sanctions, imposed for an unresolved border dispute with Djibouti and the country's alleged support for Islamist militants in Somalia. But Rohrabacher believes U.S. policy needs to change. He says it is colored by Eritrea's larger, more powerful neighbor and longtime enemy, Ethiopia. "We should not be just hanging our hats on the side of someone like the Ethiopians and just letting them direct what our policy is," he said. "Eritrea is in a very strategic location, and it is working with people that I think are very responsible people in terms of the war against terrorists." Eritrea hosts a military base operated by the United Arab Emirates at the port city of Assab, from which the UAE conducts missions in its war against Houthi rebels in Yemen. 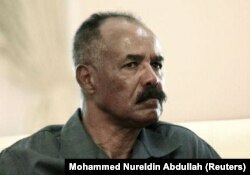 Eritrea's government has been subject to strong criticism for its domestic policies. A U.N. commission of inquiry found that Eritrea has a "wholesale disregard for the liberty" of its citizens. The commission concluded that the country imprisons dissidents without trial and forces its citizens to serve indefinite national service. Thousands of Eritreans have risked their lives at sea to flee the country. But Rohrabacher believes the U.S. will have very few African allies if it allows concerns about human rights to dictate its partnerships on the continent. "Very few of them have a human rights record and a record of [an] honest government that would be acceptable for the United States," he said. "So we should be basically figuring out what is in the interests of our country, and does that government even meet the minimum standards of being in a relationship with us." The U.S. does have historical military links with Eritrea. From 1943 to 1977, the U.S. Army operated Kagnew Station in Asmara. There, the army intercepted radio messages from other countries during the Cold War. Additionally, the U.S. considered partnering with Eritrea in 2002 when then-U.S. Defense Secretary Donald Rumsfeld visited the country and met with President Isaias Afwerki. FILE - Eritrea's President Isaias Afwerki listens during his official visit in Khartoum, June 11, 2015. But after the meeting, Afwerki said "we are not offering anything to get anything from the United States," and a partnership on combating terrorism fell through. Khaled Beshir, a board member of the Awate Foundation, a group that works to counter what it calls Eritrean propaganda, recently told the U.S. House of Representatives that a U.S.-Eritrea partnership is unlikely. Eritrea has never accepted responsibility for playing a destabilizing role in the region by arming the Somali extremist group al-Shabab, he said, and the Eritrean government continues to blame the U.S. for many of its woes. "They think the U.S. is behind pretty much everything, including people leaving the country, the sanctions, the border demarcation," he said. "I think the Eritrean government has not learned to take responsibility." Beshir believes allying itself with Eritrea would put the U.S. at odds with much of the rest of the world, who are demanding the country improve its behavior. "It's very simple. This is contrary to U.S. interests, what [Rohrabacher] is proposing, because it will go against the international community that has put sanctions on Eritrea for the last seven years," he said. "The role that Eritrea has been playing as a spoiler, as a destabilizing force in the region, I don't know how that will serve the U.S. interest, even from the security point of view."